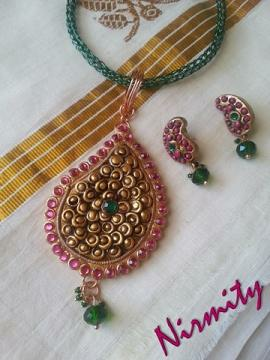 Traditionally handcrafted temple jewelry set - includes necklace and earrings. Temple jewelry is believed to have originated somewhere in the 9th century during the reign of the Chola dynasty. Back then, this kind of jewelry was used to decorate the idols and Gods and Goddesses in temples, and hence, the name. Traditional temple jewelry is made of finest gold and embedded with several precious gems and stones. Since this kind of traditional jewelry making originated in the southern parts of India, particularly in Chennai, you can see a lot of traditional South Indian dancers wearing it during their performances. This intricately hand-crafted design is inspired by one such temple jewelry motif popularly known as "manga (mango)" design and is studded with two different contrasting colored stones. The chain is completely hand-knit and the color of the chain can be selected from the purchase options. Actual product may vary slightly as it is hand made. All the handmade pieces have been sealed to protect from water and to make them glossy. Please note that clay accessories are fragile so won’t take deliberate abuse and banging. This item in Traditional Necklace Sets category was first added to our catalog on 02-19-2015. Buy Terracotta Jewelry, Temple Mango Design Necklace & Earrings set , sold & shipped by Nirmity where you can shop online for Exclusive Handicrafts & Baked Clay Ethnic Terracotta Jewelry. This Necklace Sets collection has been tagged as Focal Pendant, Maanga, Indian Terracotta Jewellery Mango Design, Clay Jewelry, Matching Earrings, Statement Jewelry, Statement Jewellery, Party Wear, India Jewelry.